Secure credential management is essential to protect data in the cloud. With Azure Key Vault, you can encrypt keys and small secrets like passwords that use keys. Azure Data Factory is now integrated with Azure Key Vault. 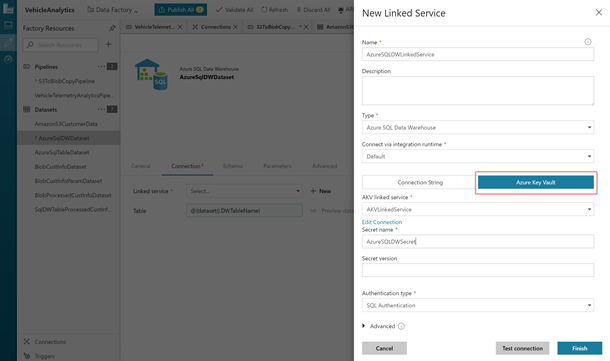 You can store credentials for your data stores and computes referred in Azure Data Factory ETL (Extract Transform Load) workloads in an Azure Key Vault. 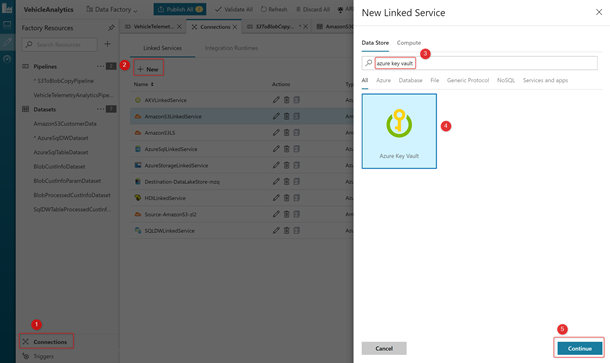 Simply create Azure Key Vault linked service and refer to the secret stored in the Key vault in your data factory pipelines. Azure Data Factory will now automatically pull your credentials for your data stores and computes from Azure Key Vault during pipeline execution. Using Key Vault, you don’t need to provision, configure, patch, and maintain key management software. Just provision new vaults and keys in minutes. Centrally manage keys, secrets, policies and refer to the keys in your data pipelines in data factory. You keep control over your keys by simply granting permission for your own and data factory service to use them as needed. Data Factory never has direct access to keys. Developers manage keys used for Dev/Test and seamlessly migrate to producing the keys that are managed by security operations. With Azure Key Vault integration and Data Factory you can manage all the credentials in one place, keep them secure in key vault, and simply refer the credentials in your pipelines. Our goal is to continue adding features and improve the usability of Data Factory tools. Get more information and detailed steps on storing credentials in Azure Key Vault.